SAN SALVADOR, Jan 6 2015 (IPS) - Julio César Cordero’s American dream didn’t last long. He was trying to reach Houston, Texas as an undocumented immigrant but was detained in Acayucán in southeastern Mexico. And like thousands of other deported Salvadorans, he doesn’t know what the future will hold. Cordero’s head hangs low as he climbs off the bus that brought him back to the capital of El Salvador. He carries only a plastic bag with a few items of clothing – and broken dreams. “I want to offer my son a better future, so I’ll probably try again next year,” Cordero tells IPS as he reaches the immigration office, on the east side of San Salvador, the dropping-off point for migrants detained in Mexico on their way to the United States. An estimated 2.5 million Salvadorans live in the United States, the great majority of them without papers. Initially many went there fleeing the 1980-1992 civil war that left 80,000 dead and disappeared in their country. “On the other hand, it’s a relief to be back in my country again,” Cordero adds. At least two flights from the United States and three buses from Mexico bring back around 150 deportees every day. The authorities are alarmed by the sheer numbers. In the first 11 months of 2014, a total of 47,943 deportees reached the immigration office – 43 percent more than in the same period in 2013. The migration authorities project a total of 50,000 deportees for 2014 – a heavy burden for this impoverished Central American country of 6.2 million people, where unemployment stands at six percent and 65 percent of those who work do so in the informal sector of the economy. The army of returning migrants does not have government support programmes to help with their reinsertion in the labour market, deportees and representatives of civil society organisations told IPS. Many of them have put down roots in the United States, and they return to this country with no support network and with the stigma of having been deported, because the impression here is that most of those sent home are gang members or criminals. “We just want a hand to help us find jobs, open a business or get a loan,” says Antonio, who preferred not to give his last name. Antonio lived in San Francisco, California from 2005 to 2010, where he worked caring for the elderly, and as a cook in restaurants. But he came back because his mother fell ill. He tried to return in 2012, but was caught after crossing the Mexico-U.S. border. Antonio wants the government to help returning migrants gain access to bank loans. He says that when they try to start over again in El Salvador, setting up a microenterprise, they run up against the impossibility of getting credit. “The mistaken reasoning of bankers is that if they lend a deportee 10,000, tomorrow morning he’ll be in New York because he’ll use the money to pay for a new trip,” César Ríos, the director of the Salvadoran Institute for Migrants (INSAMI), tells IPS. INSAMI is promoting a project to provide support for deportees in their reinsertion into the productive life of the country, in terms of job opportunities as well as access to credit. One of the measures included in the project is for the Salvadoran government to issue certificates recognising the work experience they obtained in the United States, to help them find jobs in El Salvador. “We’re not criminals; we deserve a chance,” Antonio repeats several times. 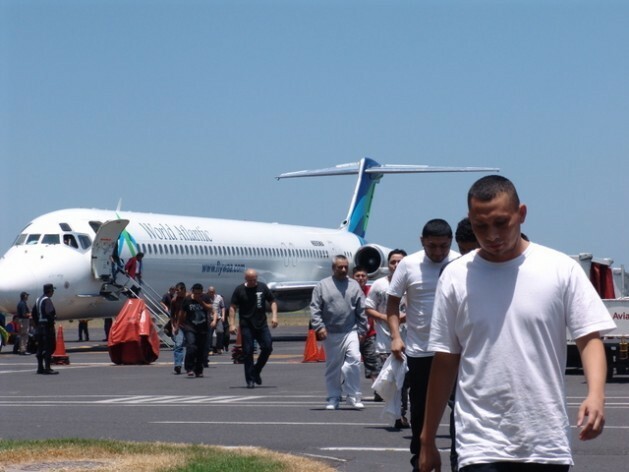 In El Salvador there is a widespread but erroneous idea that the majority of those who are deported from the United States belonged to gangs or were involved in other kinds of criminal activities. Because of the stigma surrounding deportation, some of them covered their faces when they got off the buses that brought them home, the day IPS visited the migration office. The ones who are flown back from the United States actually wear handcuffs on the plane, and when they land in the Monseñor Óscar Arnulfo Romero International Airport, they are met by a heavily armed police cordon. “The reception they are given is not a welcome; they are treated as criminals,” Karla Salas, a researcher at the José Simeón Cañas Central American University’s (IDHUCA) Human Rights Institute, told IPS. This procedure reinforces the stigma and the impression that they are criminals, added Salas, who in 2013 participated in an IDHUCA study carried out between January and March 2013, which is about to be published under the title “Deported Dreams”, on the social impacts of deportation on returned migrants and their families. Preliminary data from the study show that 70 percent of those deported have never been accused of a crime. And of the remaining 30 percent, the crimes they were accused of in the United States included assault, drunk driving and drug possession, according to the Dirección General de Migración y Extranjería (DGME), the migration office. The migration authorities recognise that the reception given the returnees is not appropriate, and say they are working to improve it. “The idea is to make the reception given our fellow countrymen more humane,” DGME spokesman Mauricio Silva told IPS. Silva said the government is working to bring together public and private institutions and agencies to create programmes to help deported migrants rejoin the labour market. For example, financing is needed to restart a pilot project that benefited 20 people with financial support for setting up microenterprises in late 2012. It was implemented with funds from the Canadian government and coordinated by the International Organisation for Migration (IOM). Antonio was one of the beneficiaries of that programme. He was given 1,400 dollars and opened a pizza parlor. Things were going well until his business was robbed and went under. Now he is trying to get a loan to start over again. For now, the only thing offered by the government is training in trades for mechanics or electricians, for example, as well as legal aid for migrants. It also provides letters of recommendation, to help deportees find work. INSAMI’s Ríos said the deportations will move ahead at the same pace, despite the Nov. 20 announcement by U.S. President Barack Obama that a priority would be put on deporting felons rather than families. The president issued an executive action that will provide temporary residency permits and jobs to some five million undocumented immigrants, including parents of young people who are legal residents or U.S. citizens, as long as the parents entered the country before January 2010. It also covers young people who went to the United States before January 2010, as children. But Obama clarified that deportations were not about to stop. The work to be done is in the hoe countries. The organisations that spend their funds here trying to sue the government and integrate people who are mainly uneducated into an economy that has fewer jobs for them might be innovative and set up advocacy institutions in the home countries – helping communities to get security and skills so that the families can stay together. If they are going to get raped or killed coming here, which is the narrative being put out these days, then stay home and fight for a better world there. It is working in Mexico now that people are getting the impetus to organize and fight back, putting pressure on the government to shape up, and on corruption and violence. I have great respect for those who have died standing up to justice there – without the there would be less mobilizing and little prospect for change. It can only change with an historical mass movement and protest – which the US will probably call a ‘revolution” and come in against the people on the side of the elites..
My country is cruel.everyone join me cultivating algae like pre Christian citystates.this mineral,plankton,makes any clean inert material super fertile.read book garbageland.all about usa.